Last week I showed some newspaper ads of Chattanooga businesses in 1933. My friend Miriam noticed that several of the businesses had telephone numbers from a couple different telephone companies and she wondered why they did this. I do not know for certain but I came up with a couple good ideas. Over the years Chattanooga has had access to at least four telephone exchanges—Rockford Telephone Exchange Company, Wabash Mutual Telephone Company, Willshire Telephone Company, and an Indiana exchange. If a business subscribed to several different telephone exchanges they could probably attract more customers. They could attract customers from out of town, from miles away, and the customers could call them without having to pay a long distance charge. The business would also benefit because it could call a larger area without having to make a long distance call. 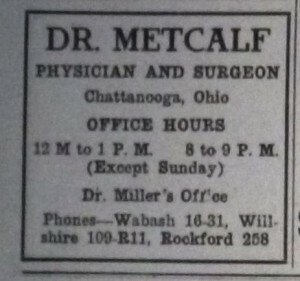 In 1933 two Chattanooga doctors used three phone companies: Wabash Mutual, Rockford and Willshire. 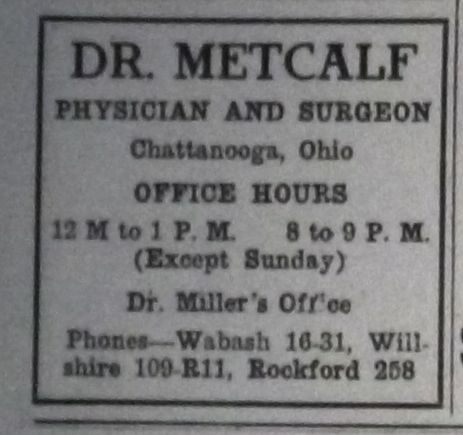 Dr. Metcalf had strange numbers by today’s standards: Wabash 16-31, Willshire 109-R11, Rockford 258. “The Willshire Herald,” 22 December 1933, p.8. According to the Wabash Mutual Telephone Company’s website, in 1911 their monthly rate was 40 cents. A long distance call to Celina was 10 cents. One toll call was 1/4 of the base rate! The cost of long distance calls would add up quickly for a business and would be quite expensive for the customers. Allowing customers to make toll-free calls would have been a good business move. In 1916 quite a few Mercer County residents had an Indiana telephone. 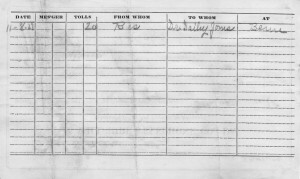 Among them was my great-grandfather Jacob Müller, a farmer in Blackcreek Township with a Willshire address. An example of a Chatt resident with an Indiana phone: P.B. Gibbons, saloon-keeper in Chattanooga, Liberty Township, Rockford. Indiana phone service extended to most of Mercer’s townships, not just those that bordered Indiana, in 1916. Those were the days when a person rang for an operator who sat at a switch board. The operator would then connect the caller to the proper party by using a patch cord. My Miller grandparents lived a couple miles north of Chatt and in the 1920s their Willshire Telephone Company number was 33-IL-3S. Their December 1927 bill for “Rental of instrument and Telephone Exchange Service for month of Dec 1927” was $1.75. On 8 November 1927 they were charged 20 cents for one toll call to Dr. Dailey Jones in Berne. There was a 25 cent discount on the bill, for a total bill of $1.70. The receipt was signed by L.L. Strickler. 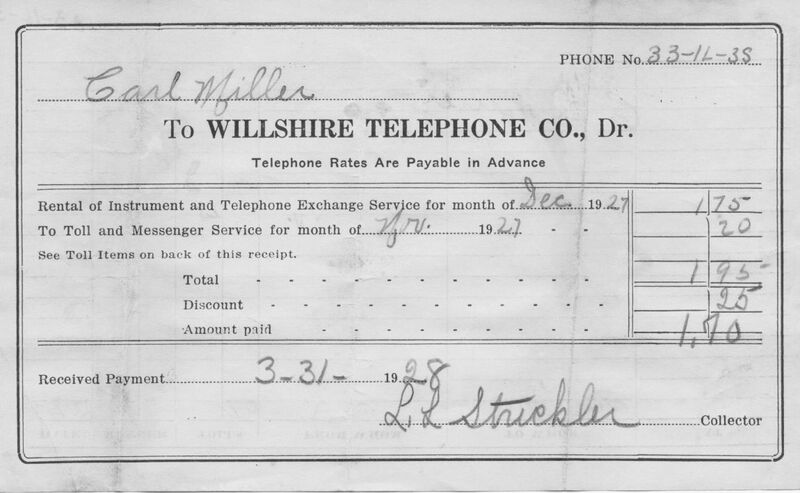 1927 Carl Miller telephone bill. What could they have been calling Dr. Dailey about? Maybe they were calling the doctor to deliver a baby. My aunt Kate was born the next day. 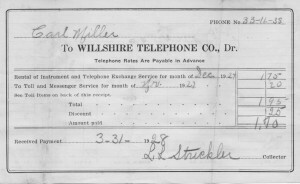 Reverse of 1927 Carl Miller telephone bill. I remember when my Miller grandparents had a hand crank phone in the late 1950s. Their number was 121F14 and grandma went through a strange series of crank turning to call someone. 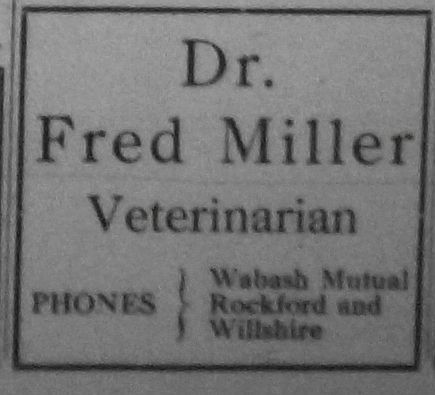 There were only five Mercer County telephone companies listed in the classified section of the 1916 Mercer County Directory: The Celina and Mercer County Telephone Co., The Fort Recovery Telephone Co., The Marion Telephone Co., The Rockford Telephone Exchange, and The Rockford Toll Line & Telephone Co.  Wabash was not included. How things have changed. Today many households no longer have a land-line but rely on a cell phone instead. This may not be the trend in Chatt, however. There are no cell towers close to Chatt and it is usually difficult to get a good signal there. Wabash Mutual Telephone Company History (http://www.wabash.com/company.php : accessed 26 December 2013). The Farm Journal Illustrated Directory of Mercer County Ohio (Philadelphia, Pennsylvania: Wilmer Atkinson Company, 1916), 117. I don’t remember my folks having a telephone while I was growing up. Maybe they didn’t need one to call the Doctor after Ann was born. The first time I used a telephone was in the Superintendents office at school when I was a Junior in High School. Then I had to ask Mr. Griffith how to use it. Times have really changed since those days. That’s interesting. 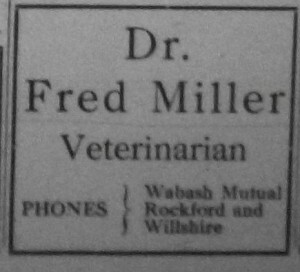 I have about half a dozen of those bill/receipts for Carl Miller in the 1927-28 years. I assumed they were his telephone bills. We know Jacob had a phone in 1916, so there would have been lines going to the house. Maybe they discontinued telephone service during the depression and for that reason you did not have a phone. 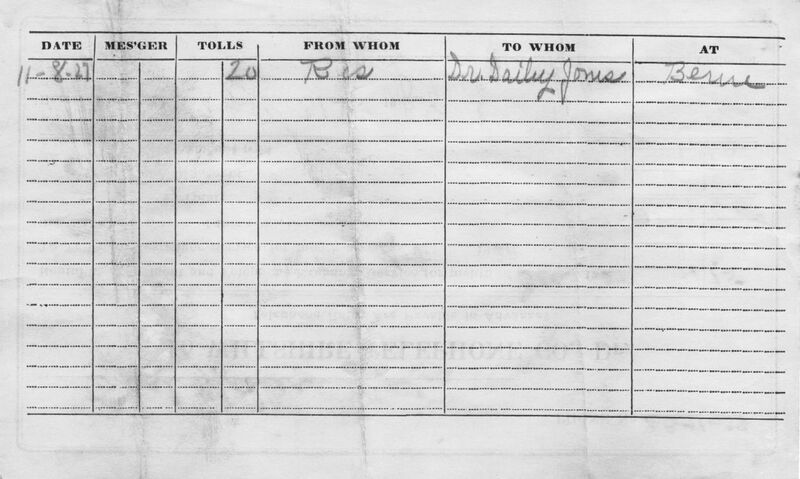 Also interesting that all of the toll calls on all the bills were to Dr. Dailey Jones in Berne, Indiana. In December 1928 there were 7 calls to Dr. Jones. Calls on December 15, 16, 18, 20, 21, 23, and 24. Someone must have been sick? Phones were very different back in this time period. Many times I have heard the story that my father and John McGough ran their own phone line between their homes. They would have been teenagers at the time or perhaps just past teen years. John and my father often worked together, ie had a milk route together, etc. The phone never included any other connections and simply ran the 1/2 mile or so from Rockfordwest Road to McGough road to the north. My experience does not go back to the 20’s but I was a telephone operator in Willshire in the late 50’s. My husband’s Mother, Lillie, was supervisor and she let her 2 sons be part-time operators in the evenings & Sat. That’s how I got the job as did my sister Martha, after I married and moved to Ft. Wayne. It was interesting. Lots of party lines in the country as private phone lines cost more. 32F12 indicated that the 12 involved a long ring and 2 short, Wasn’t hard. People in their homes had to listed to the number of rings to see if the phone call was for them. Of course people, being noisy, picked up other people’s calls to listen in!! The other party could hear the click, though, and know someone was listening. It usually wasn’t a problem unless someone was a little nutty and disrespectful. Sat mornings were hectic as people made long distance calls more. I had to go through Van Wert operators to place long distance calls so there was a period of time before the call went through. I also rang the noon whistle in Willshire (one long ring) and fire alarms (usually 2 rings) if there was a fire or more often, a car accident where the volunteer fire dept. went out . We had a little wooded booth inside the telephone office where people came to make calls for 5 cents. A lot of people did not have phones then, my parents being one. People always helped each other and took calls for neighbors, usually meaning it was something important not trivial things. People did not come in to pay their bills. IT was considered a private office except our friends came up in the evenings and hung out with me. Including my steady boy friend, Fred, whom I’m still married to for 52 years. We actually did our homework every evening and got pretty good grades since we had to be there at the switchboard. Where was the phone office in Willshire in the 50s? It is so interesting to hear about the phone service back then. Thanks for sharing your memories! I understand there were quite a few on a line back then. I remember grandma Miller used to “listen in” on the neighbors. I think she thought she was lifting the receiver quietly and carefully, but my husband says the other person very likely heard her pick up. He worked on telephones for 44 years and tried to explain the older systems to me. It was interesting to learn that people could string up a line between two houses and talk, with the use of a battery. It is so very different now.